What makes leading a meeting in English so hard? Leading meetings can be hard enough in your own language. All eyes are on you, and you are responsible for achieving an outcome in an allotted space of time. You need to deal with derailers and challenges – for example manage comments, build inclusion, develop buy in, deal with challenging meeting members, and know when to start and stop discussions. Any experienced chair person knows that this is often not an easy task! And this is even harder when you have to do it in a foreign language. Will you have to manage participants from different cultures? How will you ensure involvement when some participants speak good English, and some don’t? How will you manage the balance of power that language skills bring to the native speakers? Are you comfortable enough working in English? Relax – it’s all about the meeting, not you! When I’ve had to run meetings in Spanish or German, it took me a while to realize that it doesn’t help to worry about these questions. I quickly learned that the participants were actually interested in the content of the meeting – and not my grammar. I also learnt that the native speakers really appreciated the fact that I was doing all this in another language. I relaxed. As long as you have a structure, and some key language ready to manage the structure, you’ll be just fine. Divide the meeting into sections – for example the start of the meeting, during the meeting, and the end of the meeting. And then think about what your role is at each stage. Here are some ideas, but you’ll probably be able to think of others that are relevant to you. And then make sure you’ve got a few phrases practised for each stage. Knowing that you are able to use phrases like these, gives you that extra confidence you need when leading a meeting in English. Introducing the purpose: Thanks for getting here on time. Today we’re here to discuss the… / The aim of today’s meeting is to…. Giving an overview: We’re going to run through the main points of the agenda, the main points we plan to cover today are…. Outlining procedures: we’ll start from the top, and there should be some time for AOB at the end. Invite comments: Henri, what are your thoughts on that? Xi, perhaps you could tell us what you think about that? Clarify what someone else means: Are you saying that…? What I understood was that you’d….? Correct me if I’m wrong, but you’re saying that……So, what you’re saying is…? Can I check that I’ve understood that correctly? Test everyone’s understanding: Eva, could you summarize the main points of that discussion for us? What were the key points from that? Steer towards the objective: Could we bring the discussion back on course? This is really interesting, but we’re drifting away from what we’re supposed to be talking about. Holding off an interruption: Could we come back to that later? If I could just finish what I was saying…. Can I just finish making my point? This stage is about tying everything up neatly and making sure everyone leaves the room knowing why they were there and what they have to do next. Summarize: So, to summarize then…., So, if I may, let me just run through what we’ve agreed here…. Confirm decisions: We’ve agreed that… Everyone thought it would be a good idea to…. Delegate tasks: Our next steps are to…., Luis kindly volunteered to…, Elizabeth agreed to send us all the …. Let us know about your experiences of leading meetings in English. What have been your main concerns? What did you do to overcome them? What advice do you have for others who have to lead meetings in English? Do you ever feel your meetings have gone off track? You’re in a meeting to talk about one thing, but someone is talking about something completely different, someone else is discussing an unimportant point, and others are debating something completely irrelevant – the whole meeting has gone off track! When this happens, it’s hard to get back on track and return to your meeting agenda. In international meetings with foreign colleagues, this can be much harder as you don’t want to seem rude or too forceful about sticking to the schedule. You could watch the clock and give warnings when people are talking too much or are going over their allotted time, but again this could be misinterpreted as impolite and bad-mannered. To avoid damaging delicate business relationships, here are some common ways and phrases for getting the meeting back on track in a professional an polite manner. Let’s return to the main point of today’s meeting. We seem to be talking outside of the scope of the meeting. Do we need to add this topic to the agenda? Maybe we can get back on topic and postpone this to later? Is everyone happy if we discuss this later? I’m afraid we’re running out of time. I’m afraid I can only give you another minute. Please keep to the point everyone. Please make your comments brief. Please keep your remarks short. Our blog authors have plenty to share! We also have a number of seminars that might be of interest to you. How do you disagree with colleagues in meetings? You’re in an international meeting with people from all over the world and it’s time for you to agree or disagree with the solutions being offered. Unfortunately, you can only agree on one solution – so you have to disagree with someone. However, disagreeing with a colleague at work can be problematic. If they believe you’re being too direct – or even rude or aggressive, it could have serious consequences for your business. If this has happened to you, you may be working with a different business culture, one that expects disagreement to be softened or said indirectly to save face and maintain good working relationships. Here are some common diplomatic and polite ways of saying “no” which you can use in meetings to disagree politely and diplomatically. I’m sorry, but I just can’t agree. Hmm, I wonder if it’s true that…. Hmm, I’m not sure it can work like that. Hmm, I’m not sure whether it’s possible. Following these simple examples will help you maintain good business relationships when working with other business cultures and keep things positive and diplomatic in international meetings. Want more ways to improve your meetings? Check out our seminar on facilitating meetings for more info on how. Do you ever have someone using the meeting rooms that you booked? Have you experienced conflicts with the meeting rooms in your company? Imagine this situation: you’ve done hours of preparation for a meeting with your customer. Your slides, documents and ideas are in perfect order and you’re feeling confident. You meet your client in the lobby of the building and direct him upstairs to the meeting room you booked months ago, especially for this meeting. When you arrive, you feel a rush of panic: the door is closed and you can hear the sounds of a meeting in progress. You open the door. What should you do and say? It is important to knock on the door, enter slowly, excuse yourself and politely clarify the issue. Here are some phrases to help your issues with meeting rooms. Excuse me for interrupting. Do you have a booking? / Did you book this room? I’m sorry to interrupt. Do you have a reservation? / Did you reserve this room? The verb ‘to book’ is helpful when we need meeting rooms. We can also use the verb ‘to reserve’. Sorry for interrupting, but I have a booking here. / I booked this room. / I reserved this room. If you checked and you know you’re in the right place at the right time, it can help to be assertive and confident. Hello. Sorry to interrupt your meeting, but I have a booking at 12:00. If it’s close to 12:00, this can be a friendly way to suggest the person already in the room needs to finish his or her meeting in progress. Hi. Sorry to interrupt your teleconference, but I think I have a reservation here at this time. Can we check the calendar? It might be necessary to look together and see how the conflict happened. While these phrases can help in the uncomfortable situation that two people have booked the same room, this doesn’t really solve the problem. Employees around the world complain about meeting rooms in their office. Bookings are changed, rooms are double-booked and appointments are modified at the last minute. Do you have any tips for how to manage this sticky situation? It would be great to hear your thoughts in the comments section below. Want to improve your meetings overall? Click here for more information. It can be very helpful to use acronyms and abbreviations on PowerPoint slides during a presentation. This helps save time and space. The key is to be clear as to what they represent, and then be consistent in using them. A manager I train recently asked me to give feedback on a presentation he was giving to two new senior managers he would be directly reporting to. The presentation was about his department’s performance over the first half of this year. After introductions, he settled in to his stride and I was really pleased to see that he had taken on board a lot of what we’d been working on in training. The presentation was well structured, pace and delivery were good, and he even felt confident enough to throw in a couple of jokes. One problem; it wasn’t until a good few minutes in to the presentation that I and his audience realized what some of the topics were that he was referring to. The problem? Abbreviations and acronyms. Acronyms and abbreviations are fine, as long as everybody is familiar with them. You’d be amazed at the amount of slides, documents and presentations I see where the use of acronyms and abbreviations confuses the reader about what is being presented. Believing that your audience will automatically understand because they come from the same business area or field of expertise as you is an easy trap to fall into. When using acronyms or abbreviations in presentations, the first time you introduce them make sure to give the full word, name or title followed by the acronym or abbreviation in brackets. For example: Structured Query Language (SQL). Using only the acronym or abbreviation after this shouldn’t then cause any problems. So, being clear from the beginning with your acronyms and abbreviations in presentations can save you time and space on your slides. All the while not confusing your audience, which is the most important thing. 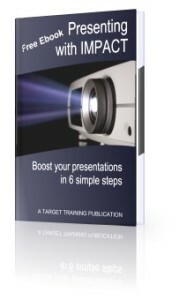 Want to improve your presentations overall? Click here. Meeting agendas are optional, right? Business meetings can be held for many reasons: to discuss a topic, find a plan of action or update team members on the status of a project. After you’ve established the purpose and need for your meeting, then the next step is to create an agenda. A meeting without a clear agenda can be compared to a ship that’s sailing without a map: you’re on the sea and going somewhere, but no one knows where. In order to ensure your ship is on the right course, send a copy of your well-written agenda 24 hours in advance and have paper copies ready for the participants at the start of the meeting. If none of the topics are relevant for one person, they can skip the meeting and focus on the tasks they’re responsible for. A numbered agenda is a powerful organizational tool. If you refer to the agenda often, you can stay in control of your meeting and the amount of time spent on a topic. Agendas can be used as a feedback mechanism for whether or not your meetings are successful. Basic information like the location, names of expected participants, date, start time and end time of the meeting. 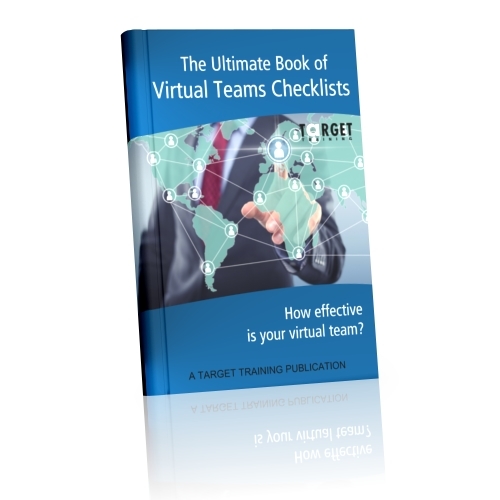 Even better, estimate the amount of time necessary for each agenda item – and stick to it. If something unimportant comes up, add it to your topics Parking Lot, or create an agenda item called AOB (any other business) that can be discussed if there is time at the end of the meeting. The AOB item can also be added to the agenda of the next meeting. The topic and the person responsible for it. If someone sees their name in writing next to a topic, they’ll know they’re expected to speak and can prepare for the meeting. An objective for each item, or for the meeting in general. If you’re searching for a reason for the meeting and you can’t find one easily, perhaps this meeting isn’t necessary. Attending unnecessary meetings results in lost productivity, which means lost revenue for the company. A clear agenda saves time, as it keeps the discussion on track. The agenda can be used as a checklist to track what has been accomplished in the meeting. Of course, there are many other elements that can make meeting agendas even more effective. However, after committing to using an agenda and following the above steps, your meetings will be more efficient and the attendees more interested in contributing. If you have other ideas for creating agendas or making meetings more efficient, please share them in the comments section below. 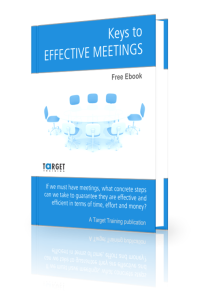 For information on how you can run effective meetings, click here.